Lark, the company that makes the wearable sleep monitor of the same name, unveiled that device’s successor on Monday: a new $150 accessory called Larklife. “In our next phase, we’re not just helping people sleep better; we’re helping people with the rest of their lives, and what matters to them most,” Lark CEO Julia Hu told Macworld. Larklife, like the original Lark which worked only when its user was sleeping, is a wearable device. But the new model is meant to be worn both day and night, and tracks not just sleep, but also steps, exercise, and—to a limited degree—diet. You're meant to wear the Larklife on your wrist full-time. To make that possible, the unit actually consists of three unique parts. Hu describes them as “a sleek daytime band, a soft pajama nighttime band, and the removable wristband sensor.” You charge the bands themselves, and then move the sensor between the two. That way, one band’s always charging as you wear the other—”so you never have any downtime,” Hu says. 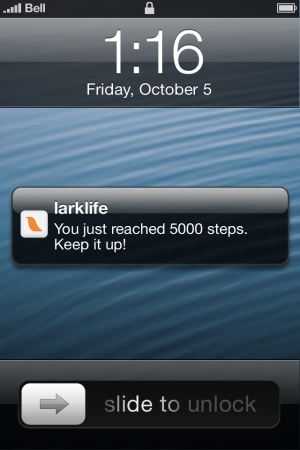 Larklife won’t be the first device to track sleep, steps, and the like; the Nike+ FuelBand, Fitbit, and (currently unavailable) Jawbone Up all offer similar functionality. Lark aims to differentiate the Larklife on both the hardware and software side. Beyond the clever dual-strap approach, “it’s one of the first Bluetooth Low Energy (BTLE) products out there,” Hu said, referring to the newer Bluetooth technology that draws less energy and can sync more passively. BTLE is also used by the new Fitbit Zip. Hu says that technology is hugely important to the Larklife. “If you don’t sync [a fitness tracking device] every day, if you sync it every two days—behavior change doesn’t work that way,” Hu said. “Behavior change is about celebrating small victories at the time you achieve them; it’s about instant feedback. When you did something good yesterday, but now you’re seeing it 24 hours later, it doesn’t trigger anything in your brain to say ‘keep on going with the good thing.’” Put simply, Hu explains, “When a dog does something good, you don’t give him a cookie six hours later.” Thus, the advantage of BTLE is that “it allows for real time feedback.” When you take your thousandth step of the day, for example, the Larklife can signal your iPhone instantly, spurring an on-screen notification cheering your achievement. The Larklife app’s interface might confound you at first. 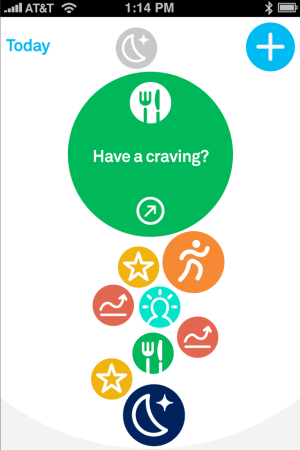 The screen shows goals and habits of yours that you haven’t yet achieved each day, the coach in the center offering advice on what you should do next, alongside achievement badges you’ve earned during the day. At the bottom, you’ll see what you accomplished yesterday. Hu said that both the app and the Larklife device leverage algorithms to calculate the best, most usable, and actionable data: “We’ve been using machine learning to ensure that our accelerometer is actually many more times accurate than what’s out on the market; it’s not just a pedometer” measuring your steps. 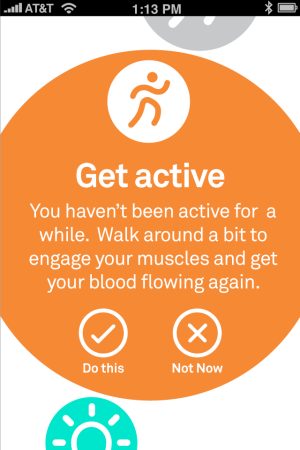 And the app can calculate information based on your measured circadian rhythms and energy levels, and use that to advise you when to relax, when to eat, and when to, say, work on something mentally challenging.